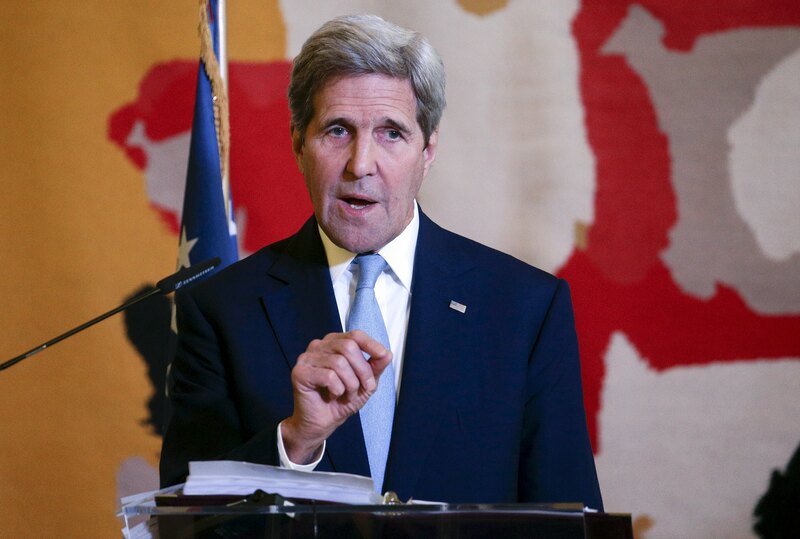 GENEVA -- U.S. Secretary of State John Kerry said in a statement released late Wednesday that attacks by Syrian forces supported by Russian airstrikes against opposition-held areas have signaled that Syria intends to seek a military solution rather than a political one. "The continued assault by Syrian regime forces -- enabled by Russian airstrikes -- against opposition-held areas, as well as regime and allied militias' continued besiegement of hundreds of thousands of civilians, have clearly signaled the intention to seek a military solution rather than enable a political one," Kerry said in a statement. He added, "We call upon the regime and its supporters to halt their bombardment of opposition-held areas, especially in Aleppo, and to lift their besiegement of civilians." The peace talks in the Syrian civil war are taking a break. The fighting is not. U.N. Special Envoy for Syria Staffan de Mistura announced Wednesday there would be a "temporary pause" in the indirect peace talks between the government and opposition, saying the process will resume Feb. 25. In a statement later in the day, de Mistura's office said the talks would take a "recess" by the end of Friday and would resume "no later than 25 February, and possibly much earlier." The delay reflects the rocky start of the talks Monday in which neither the government nor the opposition even acknowledged that the negotiations had officially begun. "It is not the end, and it is not the failure of the talks," de Mistura told reporters after a meeting with opposition leaders. Both sides remain "interested in having the political process started," he added. The conflict that began in March 2011 has killed at least 250,000 people, displaced 11 million and given an opening for the Islamic State group to seize large parts of the country from forces loyal to President Bashar Assad. "I'm not frustrated I'm not disappointed," de Mistura said of the pause. "When you have a five year war and had so many difficult moments you have to be determined, but also realistic." The last round of talks broke down in 2014. The Saudi-backed opposition, known as the High Negotiations Committee, had been reluctant to come to the talks, saying the government should first end the bombardment of civilians, allow aid into besieged rebel-held areas, and release thousands of detainees. On Wednesday, delegation head Riad Hajib said the Assad government had not met those demands. "The HNC delegation will leave tomorrow and will not return (to Geneva) until we see positive steps on humanitarian issues," he said. "This regime that ruined the Geneva negotiations in 2014 is doing it again during this political process," Hijab added. "We came to Geneva to prove to the world that this regime does not believe in a political solution." The head of the Syrian delegation, Bashar Ja'afari, said the opposition "had orders from its masters to ruin the talks." "Yes, there is a failure. It is a failure of everybody except the government of the Syrian Arab Republic," Ja'afari said. "Those who have the responsibility of this failure are the Saudis, the Turks and the Qataris. They are the real handlers and the masters of the Riyadh group." On Wednesday, Syrian government forces, backed by Russian airstrikes, blasted their way into two Shiite villages in the north, breaking a long-running rebel siege, Syrian TV reported. The villages of Nubul and Zahra are located in the middle of opposition territory and have been blockaded by rebel groups for about three years, with the army occasionally dropping food and other aid to those inside. Reaching them marked a major victory for government forces, which have made significant advances in Aleppo province in recent days. The Syrian troops severed a key supply route linking the rebels in the city of Aleppo to the Turkish border. If the pro-government offensive succeeds, it will be one of the biggest blows to the insurgents since they captured large parts of Aleppo, Syria's largest city, in the summer of 2012. The offensive has led the opposition to accuse Damascus of negotiating in bad faith. The two delegations were not meeting face to face but were in separate rooms, with de Mistura shuttling between them in the so-called "proximity talks." He had scheduled the talks to last six months. De Mistura said he will ask the U.N. Security Council and the International Syria Support group of about 20 regional and world powers to address some of the pending issues in the talks, including what can be done "to make a difference for the Syrian people." He said both sides had expressed concerns about the talks, with the government wanting to address "procedural issues before talking about (the) humanitarian side." He said "the U.N. cannot allow simply procedural matters to actually become more important than actually the result for the humanitarian situation for the Syrian people, who have been waiting for us to deliver not a conference but something concrete for them." He said he would not directly address the battlefield developments, but that "military activities and other reasons" had made it impossible to make headway on humanitarian issues, such as the lifting of sieges on many cities, towns and villages. Western powers expressed support for de Mistura and sharply criticized Assad and Russia. French Foreign Minister Laurent Fabius said France condemns the "brutal offensive by the Syrian regime with Russia's support to encircle and asphyxiate Aleppo and its hundreds of thousands of residents." In a statement, Fabius said France backs de Mistura's move to suspend the talks under such circumstances, saying Assad's regime and its supporters "visibly don't want to contribute to them in good faith, thus torpedoing peace efforts." "We call upon the regime and its supporters to halt their bombardment of opposition-held areas, especially in Aleppo, and to lift their besiegement of civilians," he said. U.S. State Department spokesman John Kirby said that Russia had voted for the U.N. Security Council resolution that paved the way for the talks, noting the measure called on Syria's "regime and all parties to cease bombings and other attacks on civilians - not eventually, but immediately. Not soon, but now." "It is difficult in the extreme to see how strikes against civilian targets contribute in any way to the peace process now being explored," Kirby said, noting that de Mistura "paused the talks in Geneva in part because of the difficulty of seeking political solutions while humanitarian aid is continually disrupted and innocent lives are taken." For the opposition, the government's advance in Aleppo cast a long shadow over the talks. Basma Kodmani, a member of the opposition's negotiating team, described the offensive as a "horrible development," saying it sent the message that "there is nothing to negotiate. Just go home." Syrian TV said the siege of Nubul and Zahra was broken by the army and pro-government militias known as the Popular Defense Committees. The Hezbollah-owned Al-Manar TV also reported the advance, showing video of the fighting on the outskirts of the villages. The Britain-based Syrian Observatory for Human Rights, an opposition group that monitors the conflict, said the Syrian army was Less than a mile from the two villages. Meanwhile, an aid convoy headed to a besieged rebel-held town near Damascus. The convoy heading to Moadamiyeh is the second aid delivery to rebel-held areas near the capital in as many days, a spokesman for the International Committee for the Red Cross said. Pawel Krzysiek told The Associated Press that 12 trucks of food, medicine and medical equipment were expected to arrive later in the day. He posted a photograph on his Twitter account showing hundreds of people waiting for the supplies. The humanitarian situation in the town worsened toward the end of 2015 after the government choked off the last access point. Opposition activists and residents say there are dozens of cases of severe malnutrition in Moadamiyeh. Kodmani called the latest aid delivery a "positive development," but said "it is way below what we are hoping to see happen."